Every year I make myself wait until after Thanksgiving to start thinking about Christmas. No Christmas decorations, no holiday music, no gift shopping until I have properly stuffed my face with turkey. And every year I find myself in a mad rush to find last minute gifts. This year I’ve decided to take a new approach. In respect for Thanksgiving, I will still keep the holiday tunes and décor to a minimum, but I am going to start thinking about gifts a little earlier to spare myself any last minute stress. I thought I would help my readers out too by creating my first gift guide of the year. 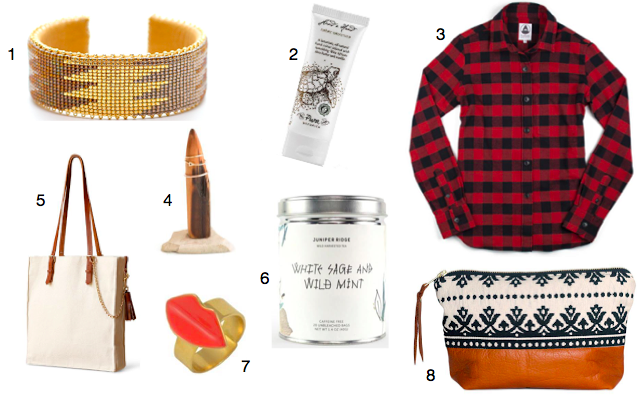 Last year my first seasonal gift guide revolved around a company called Orange Harp. For those of you who have never heard of Orange Harp, Orange Harp is a mobile app that serves as a marketplace for high-quality, ethically crafted, socially conscious products. They partner with brands that make things the right way. The thing I love most about Orange Harp is that they believe you don’t have to sacrifice quality or style to lead a conscious life. Since my original gift guide, Orange Harp has grown in many ways. They currently have partnered with 45 brands and sell over 4,000 products. Orange Harp has also updated their app with filter options for easier navigation. In my opinion, the coolest new addition is their Orange Harp Heroes program. They encourage users to send in their socially conscious tips and stories so Orange Harp can share them with the world. You can email you tips to life@orangeharp.com for a chance to win a $10 gift card. All the products below are available on the Orange Harp app which you can download from the app store. You can click the links to learn more about each product and why they’re considered socially conscious. This is your lucky day because you can also save some money by using the code GREATERGOODS at checkout to get 15% off your entire purchase (valid through November 30, 2015). Happy shopping! Categories: Uncategorized | Tags: Accessories, bracelet, Charity, Christmas, Clothes, fashion, Flannel, Gift Guide, Giving Back, Home, Jewelry, Lifestyle, Orange Harp, organic, Socially Conscious | Permalink.